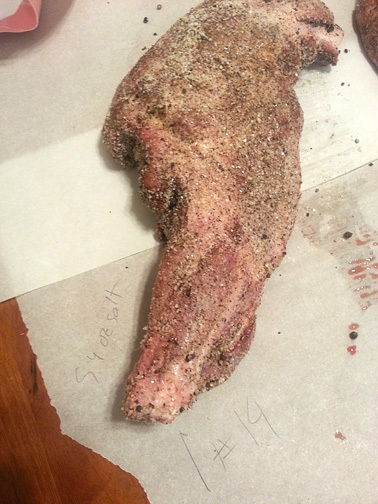 Curing Wild Boar | Have YOU Ben Starr Struck? My wonderful neighbor Ron surprised me a few days ago with some cuts from a few wild boar he shot on a recent hunting trip. I took that as my excuse to get set up for home-curing…something I’ve been researching for a VERY long time. Curing meat through the application of salt, occasionally smoke, and subsequent hanging to dry, is the oldest form of cooking. It’s been practiced by our ancestors for thousands of years. And cured meats are among the most sought-after and expensive artisan food products on the planet. Ever heard of Prosciutto di Parma or Prosciutto di San Daniele? How about Jamon Iberico or Speck? These are all dry cured hams from artisans in Europe, and they can run upwards of $1,000 PER HAM…or around $75 per pound. And the techniques used to cure these meats have been passed down through families for generations. There was a time in our own country’s history where virtually everyone on the farm cured their own hams and bacon, so they could be hung in the cellar for months at a time, without requiring refrigeration. (When was the last time you saw a ham for sale that was hanging from the ceiling of the store, unrefrigerated, rather than in a cooler?) Properly cured hams can last 2 years without being refrigerated. The process of curing concentrates the flavor of the meat into an explosive, pungent burst of taste in every thinly-sliced morsel. Virtually any meat can be cured. (There’s even such a thing as duck and ostrich prosciutto!) Wild meats are well-suited to curing, and in places where cured meats are eaten regularly, like Italy, wild boar meat is especially sought-after. So it made perfect sense when Ron gifted me 2 shoulders, 2 legs, and 2 loins that I cured them all. I selected traditional Italian recipes for the curing…and by “recipe” I really mean “method.” Salumi (the Italian word for meat curing) is the art of taking what nature has given us, and doing as little as humanly possible to make it the best it can possibly be. The recipes for the classic hams of Europe call for nothing more than meat and salt…and perhaps a bit of black pepper or wine. That’s all. 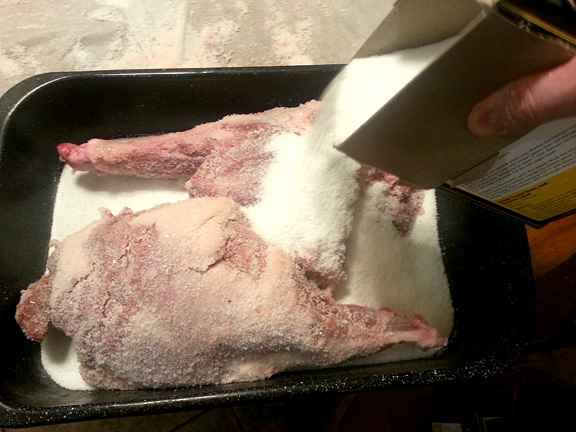 The starting point for curing meat is the salting procedure. Most recipes call for a salt addition equal to 8.5% of the weight of the meat. Which means you have to weigh your meat. 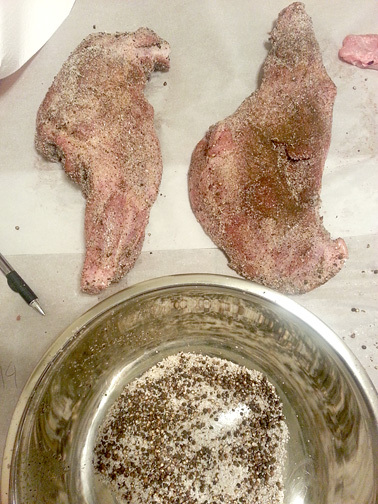 Here you see the shoulder, which will be cured into “spalla,” already rubbed with salt and black pepper. You can see the weight and salt requirement written on the parchment near the cut. It’s very critical when curing meats to minimize the amount of bacteria that come in contact with the meat. So always wash and sterilize your hands (or wear sterile rubber gloves), and work on surfaces that are immaculately clean. The salt helps prevent bad bacteria from growing on the meat, but the less bacteria the salt has to deal with, the better. Above, you see the back legs (or hams) of the boar, which will be turned into prosciutto. 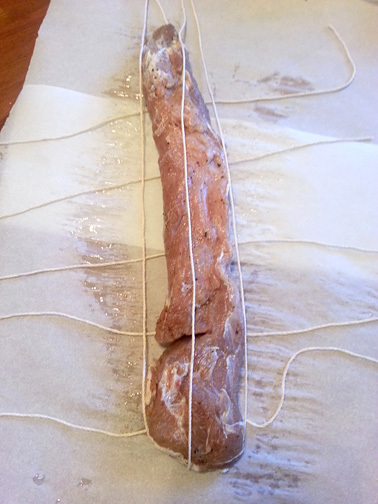 Making the correct cuts for each type of salumi is WELL beyond the scope of this blog. (Book recommendations will follow.) For beginners, it’s best to leave the bone in the cuts while curing, because the more you slice into meat, the more crevices you leave for bacteria to take hold! Once the meat is prepared, you add 8.5% of the weight of the meat in salt. (I used Morton’s kosher salt.) Rub the salt all over the meat, and make sure to get into all the nooks and crannies of the meat, where the bacteria may be hiding, as you see in the photo to the left. Then you place it in the fridge and weigh it down. The amount of weight depends on the original weight of the meat. For prosciutto, you want to use a weight equal to the meat’s weight. So if it’s a 10 pound ham, you need to place 10 pounds of weight on top of it. It’s best to place a small baking pan on top of the meat, and then your weight. I used cast iron skillets and cast iron lids. You can use bricks, big cans of tomatoes…whatever you have. For smaller cuts like loin or shoulder, 8 pounds of weight is a good all-purpose weight. Refrigerate the meat for 1 day per 2 pounds of weight. Every day or so, flip the meat in the salt and rub it with salt again. You’ll notice juices leaching out of the meat. If there’s enough juice to gather in the pan, pour off the juice. If there’s just a bit of juice, mix it with the salt and rub it back onto the meat when you flip it. Once the meat is tied, it’s time to hang. Up to this point, no “special equipment” has been necessary to cure meat. But now, you need a temperature and humidity controlled environment that the meat can dry in. If you have a cellar or unfinished basement pretty much ANYWHERE in the country, the conditions there are probably ideal for meat curing. You want a temperature between 55 and 70 degrees, and a humidity level between 60 and 70 percent. If you don’t have a cellar or unfinished basement, you have to build yourself a curing “room.” I did it in an old refrigerator (which cost me $50 on Craigslist) plus about $150 worth of equipment to precisely control temperature and humidity. 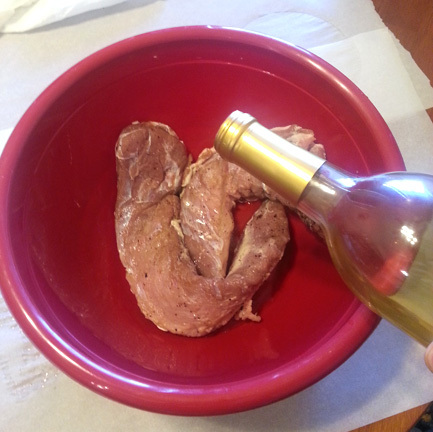 (Check out the blog post on how to convert a fridge into a curing chamber.) Some people cure in a mini-fridge turned to its warmest setting with a bowl of water added to contribute humidity, and have excellent results. 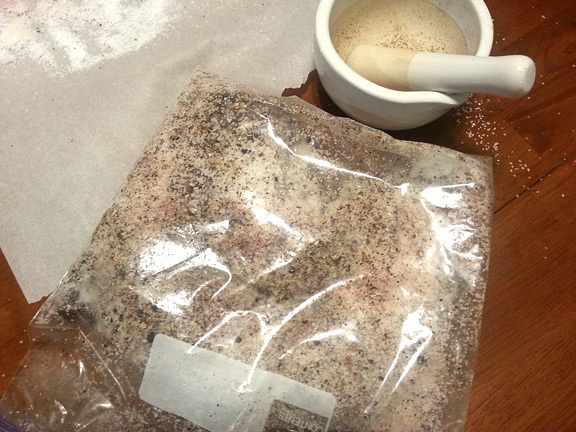 So if you want to try home-curing on the cheap, that’s a great place to start. But unless you can accurately know and control your humidity and temp, don’t expect exceptional results. 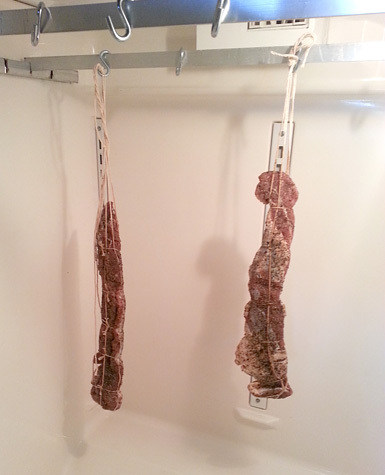 The meat needs to hang until it has lost 30% of its post-salting weight. (So make sure to weigh your meat after the salting and pressing!) For small cuts like young wild boar, this can happen in a few months. For a large 25 pound ham, it can take a year. These 14 ounce lonzas at left will probably be cured in a month or two. The 4 pound hams will probably be cured in 4-6 months. The longer you cure meat, the drier it gets, but at some point it will become so dry that it’s nearly impossible to slice and eat. So it’s not a Bordeaux, which you can keep for decades and it keeps getting better. Aging (hanging) meat is an art. I’m no expert, and neither are you. Salumi artisans in Italy, who’ve been doing it since childhood using family techniques perfected across centuries, will stick a long thin bone into the prosciutto and remove it, and they can tell by the smell when the ham is ready to eat. And there are a HOST of things that can go wrong during the hanging phase…if you start getting any color of mold other than white growing on your meat, you need to wash it off with salted vinegar, and say an earnest prayer that the mold isn’t growing on the inside of the meat, as well. If you are curing in a cellar or basement, you have to be careful of pests, as well…mice and insects. (That’s less of a problem in a retrofitted fridge.) However, the best cured meats in the world come from damp, dingy, century-old, dirt-floored basements in Europe, and just like the French attitude toward wine, the Italians say that only Mother Nature can make salumi. If you start with a good pig, and have the right environment, excellent salumi will result. Note the operative words there…”good pig.” You can’t go to the grocery store and buy a ham, and make superb prosciutto. Commercial pork is raised with a careful diet that makes it leaner than chicken. Such meat will NEVER produce even decent salumi. The Italians have heirloom breeds of pig that are renowned for having a high fat content, and they feed these pigs acorns…fruit…milk…and a variety of natural foods that produce meltingly-tender, fatty meat that is perfect for curing. So don’t bother going to the time and expense of home-curing unless you have a source for excellent meat. Luckily, there’s probably a pig farmer within a hundred miles of you who is raising heirloom pig breeds. Red wattle hogs are becoming the popular breed for American farmers to raise…they are much-loved in Italy. Craigslist is an excellent place to start, as is a visit to your local Agriculture Extension office. If you can find a source for hand-raised, heirloom-breed pork, then you’ve got the perfect starting point for making world-class salumi at home. For an excellent primer on curing meats at home, check out Salumi: The Craft of Italian Dry Curing by Michael Ruhlman and Brian Polcyn and Charcuterie: The Craft of Salting Smoking and Curing, by the same authors. Subscribe to my blog in the window near the upper right corner of your screen, so you don’t miss my post on how to build a home curing room using an old fridge! And feel free to comment below…I’d love to hear any stories you have about home curing, or about great memories eating excellent cured meats! This entry was posted in Blog and tagged age, at home, charcuterie, cure, cured, curing, hang, hog, homemade, how to, humidity, kosher, meat, pork, red wattle, refrigerator, salt, salumi, temperature. Bookmark the permalink. I’m new to this and about to build out a curing chamber from an old fridge. Curious one thing, I’ve read a lot about airflow in the chamber but what I don’t know is whether it needs fresh air, as in cutting a couple holes in the fridge, one with a fan (computer fan) and the other as vent. Or will checking on them daily be enough fresh air? Several designs I’ve seen have a small fan in the bottom of the fridge – with no vent. I assume they are using a timer or maybe they are connected to the humidifier controller. I hope that makes sense – any tips are appreciated. I resided in Naples, Italy for three years. During my time there I befriended a neighboring farmer who raised 3-4 pigs a year. 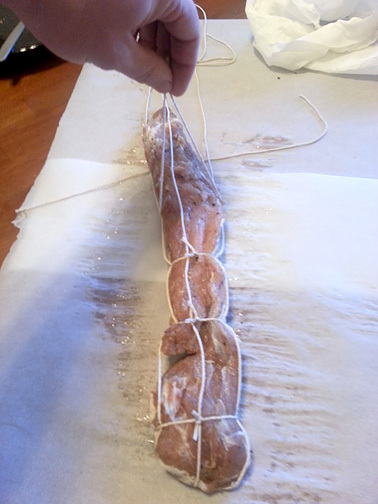 One year I asked him to save the hind leg so I could learn to make prosciutto. The farmer, Pietro, was going to be my instructor. 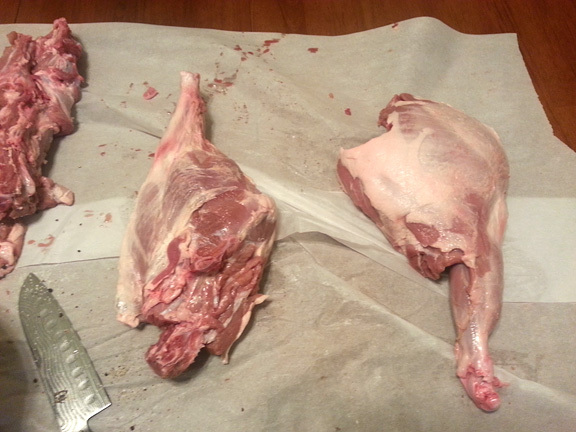 I helped him slaughter one of his pigs and I received the hind leg and complete instruction on how to prep the leg. We never weighed the meat or salt, but there it was in a salted box where I cared for it until Pietro called me and said it was time. Time to bring the salted leg to his farm. Once i arrived on the farm, Pietro took the pork leg and placed between two heavy plywood boards. He went over to his tractor, started it up, and drove the tractor onto the plywood. Back and forth, forward and reverse, he maneuvered the tractor and than climbed off of it. He had flattened the pork leg and it assumed the look of a prosciutto. The salt was removed and in Southern Italy instead of cracked black pepper, they use chili pepper flakes and lots of it. Not only does it give the meat a bite and different taste that I have become accustomed, but the chili pepper is suppose to keep insects away while it is hanging outside in the cold weather. It was a superb piece of Salumeria and I saved it until Spring when my Step-Dad and Mom came to visit. I took my Step-Dad into our kitchen shortly after arrival from his long trip and opened up the fridge door. On one of the shelf was that wonderful prosciutto covered in cheesecloth. Prosciutto was his favorite cured meat. I told him, “this is all yours.” My parents’ visit was 3 weeks and believe or not he ate the whole prosciutto all by himself. He would get up in the middle of the night and I would sneak up on him while cutting chunks for his nightly snacks. The experience of making the prosciutto was extremely exciting. I also made salame, salsicce, and lots of wine to wash down the delicious Italian meals we made. It was a beautiful and unforgetable experience of our stay in Bella Italia. 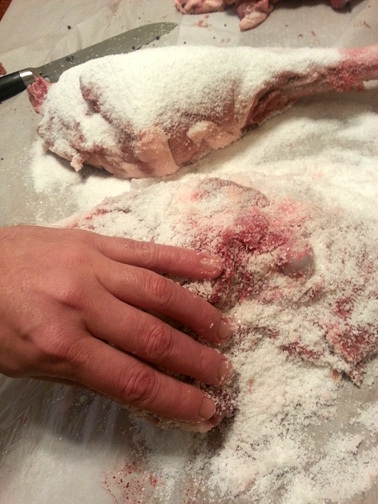 If you are talking about breaking down the joint BEFORE salting, the sliced area will get covered when you salt. If you are talking about slicing the meat for serving AFTER it has cured…if you’ve properly cured it, you won’t need to salt the newly exposured, cured flesh. But it IS good to keep everything wrapped when you store it. Quick question about your chamber. Do you get accumulation of water at the bottom of your chamber all around the humidifier? Alex, I never had water pooling, though occasionally a little juice from bigger cuts that were hanging. I wouldn’t worry too much about it as long as your humidity inside the chamber isn’t TOO high, and you don’t have electrical components directly in the water. Awesome, how did it turned out?? ?